With a tear in one eye and laughter in the other I am looking at my almost packed suitcase. One more sleep and I’ll be on the way home. I had a wonderful three week “Kur-Holiday” in relaxing Bad Woerishofen with daily concerts morning, afternoon and evening, long walks in the forests listening to cuckoos and song birds and after a few kilometers a stop in a place offering the most fantastic meals or cakes… early mornings are busy with treatments, between 4 and 5 AM a wrapping or hay-pack (called the morphine of the Kneipp cure) in bed, an hour later an alternate rinse or bath for arms, legs or back, whatever the doctor ordered, after that twice a week a massage or reflex zone treatment for feet up to the knee, bedrest after that for an hour, breakfast (no chance to lose weight – unless you are on a type of fast) a 3-course noon meal at 12.30 and a lighter evening meal at 6 PM. I always needed a nap… did I have time for shopping? Yes and no, not enough. Shops close over noon hours, are not open after 5.30 or 6.00, Saturdays they close at 12.30 and only once a month are open Sundays. I want to come back next year, God willing to give me good health for traveling. Wanna come? Children naturally love water. Playing in the bathtub and not wanting to get out, running around in a summer rain, jumping into puddles and squishing the mud between their toes, wading or sitting in play pools and, best of all, building sand castles running back and forth at the ocean and screaming when mom says “It’s time to get out of the wet bathing suit…” Yes, – mom is right. The nerve endings for detecting the “cold” when it’s too cold have not developed in the skin of children yet. They can take the cold water for a long time, even to the point of turning “blue”. It’s probably nature’s way to protect them but it is also detrimental for their health. Look at this happy picture of grandfather and child. There is nothing better than cold water to cool down on a hot summer day. Running cold water from your toes up your legs (always start on the right foot, it being the farthest spot from the heart) is wonderfully refreshing. Using a garden hose to do this is even better. What happens in the body? Warm or hot days make you feel lazy. Why? Because your blood pressure sinks and your energy level declines. The cold water on your legs helps to increase the circulation to the upper body by pushing more blood out of the legs, – to put it simply. It clears your head and you can even see better. Try it! It was a bit cooler today, we had some rain last night. By far not enough here in Bavaria while they had heavy thunderstorms in other parts of Germany. During the morning, after my water treatment and massage, I packed up some clothing I don’t need anymore and went looking for a Salvation Army container to donate it. I saw a Red Cross shop, just looked in for curiosity sakes. I could not believe a) the quality of their donated offers, and b) the prices. 2.00-3.00-5.00 or 7.00€ for really GOOD stuff. If I ever come back, I’ll travel without a suitcase, get what I need, donate it at the end of my trip and be worry free on my way home. But, now I need to tell you about that afternoon. After a healthy noon meal and a little nap I took my Nordic Poles and wandered off. I got myself a kilometer counter. I seemed the only person walking through still blooming meadows, quiet forest as the birds were resting during the midday heat. Coming by a Hunter’s restaurant I decided not to stop for their fantastic cheese or apple cake. I rested on a bench for a while, feasted my eyes on the beauty surrounding me and checked my km counter. It said 3.7 kilometers. After another 3 km I arrived at the “Kurpark”. I was drawn to a bench in the sunshine, occupied by a big elderly gentleman with a bright red sweater, his pretty little brown dog next to him. For an unexplainable reason I stopped and commented on the dog. I am a bit of a dog nut, and this was one I could have fallen in love with. I heard a sad story about it, how it was born in Spain in a garbage pile with three others, the mom went out scavenging for food, came to nurse and went off again. The dog babies were very afraid and shy, but this man and his wife decided to rescue one. They picked a little boy and called him Carlos. Carlos liked me, sniffed my hand but did not lick it. We just sat there next to and looked at each other. Then Carlos decided he had enough sun, got down, the man let the leash out and Carlos settled in the shade of a nearby tree. Now, as you can guess, the man asked me if I lived in this town. When I told him about my home in Canada, he was amazed that I still spoke perfect German without an accent. I mentioned that I have a book reading next week. Can you imagine that the next half hour was taken up with ‘what, where, when etc.’ – and how that little dog had made me stop to experience something so totally out of the ordinary. I needed to share this with you! Sebastian Kneipp was by no means the inventor or the first one to use ‘water’ for healing. The Persians used water therapy 5000 years ago, the Romans did several hundred years ago followed by a decline caused by an outbreak of venereal diseases. (Too many unwashed bodies sitting in the same pool) Two medical doctors, Father Siegmund and son Johann Siegmund Hahn are credited with bringing the idea of using water to improve health back to life in the very early 18th century. The little book “The Effect of Water unto and into the Human Body” (loosely translated) was the next BIG step in the developing water therapy. Before S. Kneipp discovered this book and used its recommendations, got well and is now known as “The Water Doctor” several other personalities using their own form of water therapy need to be mentioned. A farmer’s son, Vincent Priessnitz in Austria with similar experiences as the later living Kneipp. Johann Schroth, who developed the “Schroth Kur” involving some water therapy, extreme fasting with very light vegetarian food, walking and interesting ‘dry’ and ‘wet’ drinking days. The ‘wet’ days starting with a glass of light wine. This “Kur” is still offered in Oberstaufen, Bavaria and people from far and wide attend. Another, a very sick man coming from USA was Benedict Lust who spent time with Father Kneipp as well as attending the Oberstaufen Kur, got well and started the “natural healing movement” in America. He studied medicine and became one of the founders of modern Naturopathy on his continent. There were a number of others, especially in the UK, who contributed to the development. Father Kneipp started out with just cold water. He insisted to get warmed up before any treatment through wood splitting or fast walking and having a bed rest covered in blankets after the treatment to induce the body to heat up and sweat out the disease causing impurities. The rule is “no cold treatment on a cold body.” To go back to bed for up to an hour after any prescribed water treatment is still followed to this day. The reason is to get the body to respond, create warmth and thereby also affect the immune system. 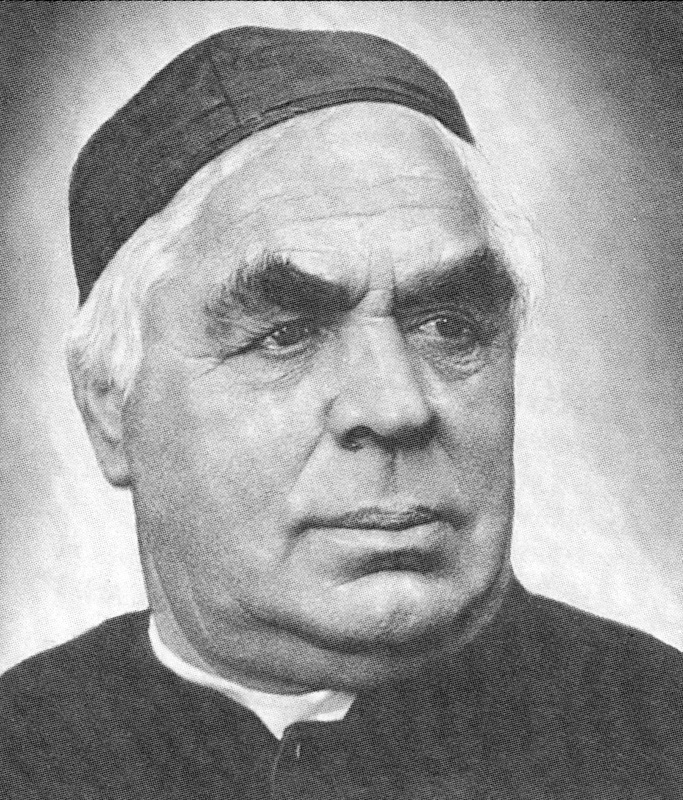 During the last twenty years of his life (he died 1897) Father Kneipp gradually changed his approach. As he saw not just tough hard working men but more and more aristocrats, weaklings in his estimation who had to be ‘built up’ he came from cold water to alternate and from full body immersion or ablutions to partial body treatments and warned ‘no two treatments on different body parts one after the other.’ So if the legs were treated in the morning you did not get a treatment for the arms or the upper body until the afternoon. There should be at least three hours between applications. For physiologic reasons the medical profession confirmed the wisdom of it, once they got involved. “I bequest my system to the medical profession with the challenge to keep it, improve it but mostly, make it accessible to all.” That was written in his testament. Over the years following his death there were disagreements between the Brotherhoods who had received his sanatoria and different doctors. After WWI wounded and recovering soldiers were sent to Wörishofen for rehabilitation. During the time of the Great Depression until after WWII there was a decline but the flood of wounded soldiers during and after WWII caused a resurgence of the “Water Cure”. A few years after the West German Republic was founded and life had stabilized, the German Insurance companies paid for a “Kneipp-Kur” for their members when prescribed by a medical doctor. It proved less expensive than other methods of rehabilitation. In the nineteen-eighties the Insurance companies even started to build their own sanatoria. The Austrian Government approved a study with 15.000 people led by trained Kneipp-Doctors which proved without a doubt that the group treated with conventional PLUS Kneipp treatments recovered much faster than the group treated the old way and reduced the health care cost by three times. Water: Treatments consisting of all forms of water: Cold, warm, alternate, steam; full body treatments or partial treatments with water from washings, immersions, ablutions, packs, body wraps partial or full treatments according to the health issues diagnosed and prescribed by a certified Kneipp doctor. They are administered by a certified Kneipp Therapist. Herbs: The use of the healing power of herbs inside and out. Herbal infusions or extractions in all bath treatments. Food: Simple, healthy, wholesome nutritional food, diet if doctor recommended. Herbal teas although Kneipp also allows a wheat beer on occasion. At this point I would like to mention that Kneipp was the first to collect and catalogue herbs and healing plants which became the base for what we now know as “Naturopathy” and “Homeopathy.” Another man very much involved in this development was Kneipp’s former patient, Benedict Lust from America who is the “Father of Naturopathy” in USA. Exercise: Active and passive exercise. All forms of exercise from yoga to walking, biking and everything in between. Passive exercise consists of all forms of massage used to increase circulation. The easiest water treatments are the ‘water stepping’ and the cold ‘arm bath’. 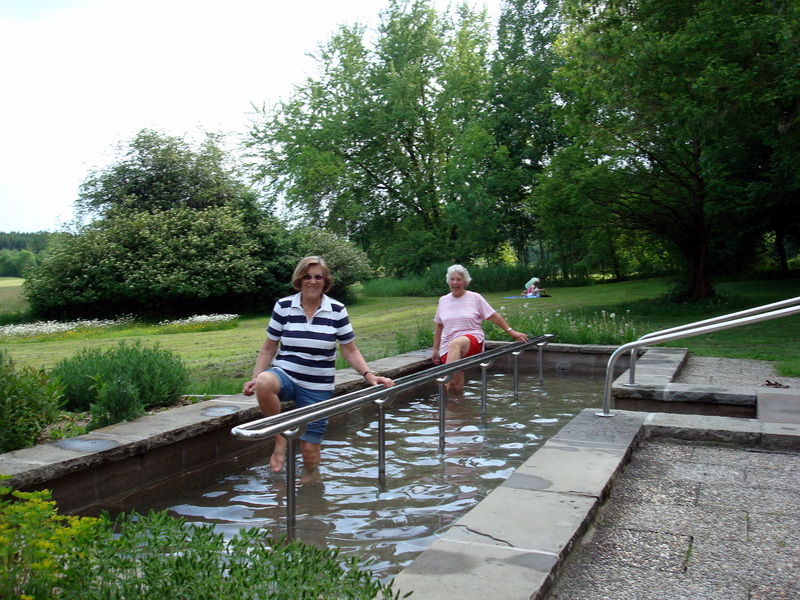 All Kneipp Spa cities and most Kneipp Groups in villages and towns have established water stepping sites along their hiking and walking trails in forests, meadows, and many resting places in parks. After a good hike the water stepping is very refreshing and surely will avoid swollen and tired legs. The water usually comes from a stream and is quite cold. You walk through the basin two or three times like a stork, lifting the leg out of the water for an exchange of air-water, air-water until the cold “bites”. Now it’s time to get out and walk on the adjacent lawn until your feet are dry and starting to get warm; sit down on a bench and put socks and shoes back on. Just use your fingers to rub the place between the toes dry to avoid the moist warm spots that fungus likes. 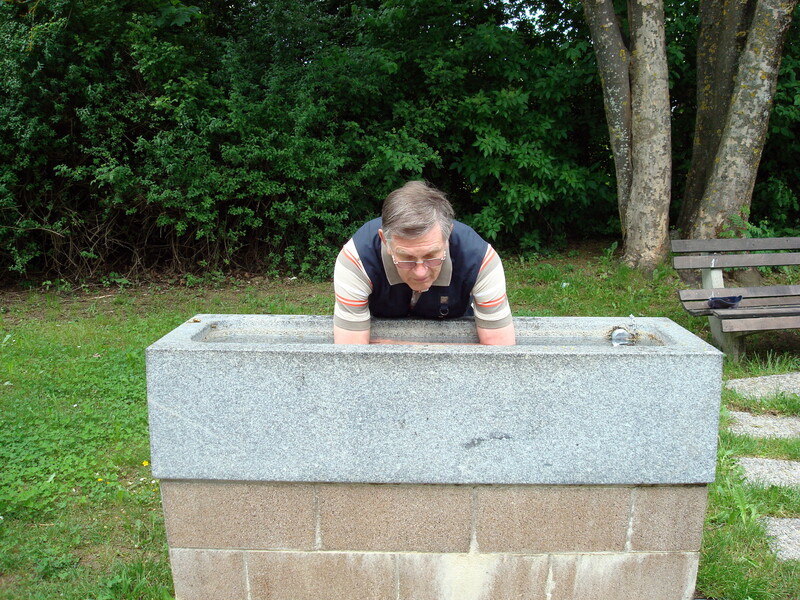 Usually next to the stepping basin is also an arm bath trough. A sign tells you NEVER do both, the stepping and the arm bath. Many people prefer the stepping for the incredible feeling of wellbeing. The arm bath feels refreshing as well, it especially clears your head, lifts your mood, and in general is good for your heart, lungs, brain. Take a deep breath before you dip your right arm in first, followed by the left and e-x-h-a-l-e deeply. Now breathe normally. Count to about twenty or thirty or wait until the cold ‘bites’. Lift the arms out, stroke the water off with your hands and swing the arms until dry while walking around on the nice lawn next to the stepping basin. Make sure the hands and arms get warm again. It feels good to wear a long sleeved shirt or something of that nature after the bath. In both cases, water stepping or arm bath, – do not use a towel to dry the skin! Stroking the water drops off and letting the air dry you, is the water doctor’s prescription! By the way, you can do water stepping in your bath tub and a cold arm bath in your sink at home. For detailed advice on how to use water for healing at home, order my inexpensive booklet with photos from: https://giselleroeder.com/bookstore/ or send me a message on my FB page https://www.facebook.com/WeDontTalkAboutThat since I still have a few copies for the special price of $7.00 plus (approximately) $4.00 postage. Can you imagine the triumphant reception when Father Kneipp returned from Rome to his small little village? Not excommunicated, but praised by the Pope? The simple folks at home had trouble pronouncing and calling him ‘Monsignor’ – but he just laughed and said ‘don’t even try, I am what I always was, your ‘Father Kneipp’. He had been sent to Wörishofen by the Archbishop to hide him away, to get him away from the ‘water splashing’ and just be the Father Confessor to the nuns of the existing convent in a small village in the middle of nowhere. These nuns were mainly second and third daughters of rich aristocrats who couldn’t be “married off “, a privilege reserved just for first born babies, sons to inherit and daughters to marry other heirs. The nuns had spent their days singing and praying and were shocked when Father Kneipp told them “Ora et Labora” – pray and work, because work is a form of praying. He ordered them to tend the overgrown gardens, plant and harvest vegetables for the convent’s dinner table and establish an herb garden. They had to perform kitchen duties and clean their own quarters. Tears and complaints about ruining their soft white hands in dirt and sun did not result in suspension from work; pretending to be sick or having a sore back resulted in being treated with water. The convent was close to bankruptcy despite owning fast stretches of land, meadows and acreages, forests and streams. Father Kneipp found the acreages and meadows were “sour” but knew the farmers would not accept his advice, the advice of a priest, who knew how to change it. Therefore he invented “Fritz” and wrote booklets about “Fritz, the successful Farmer”, “Fritz the Bee Keeper” and several others. The advice was followed and the land became rich and fruitful, the farmers were happy and the convent thrived with “Fritz’s” help. Despite his book “My Water Cure” to keep them away, health seekers and especially poor people kept coming. The laundry room of the convent became the first treatment center. The odd items used in this “Wash House” are displayed in a specially built hut at the ‘Promenade” in what is now ‘Bad Wörishofen’. Several nuns and handpicked men became helpers and the first therapists. 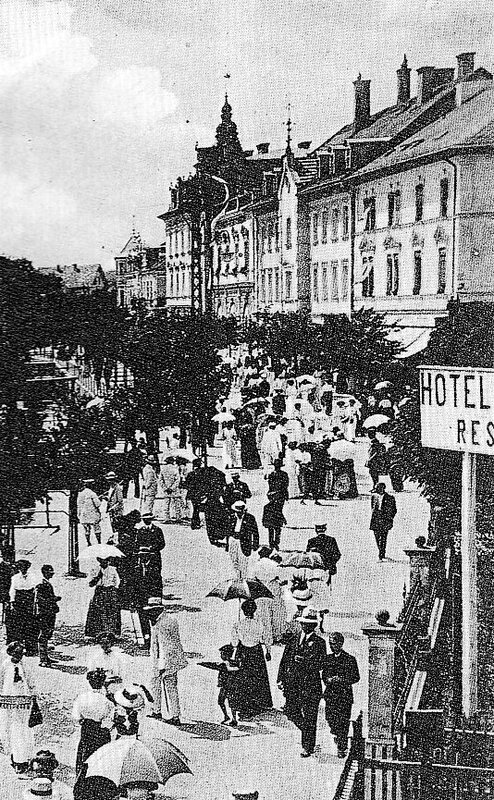 A few curious doctors asked permission to attend Father Kneipp’s hour of seeing people and hoped ‘to trip’ him. The deep knowledge of the human condition and his uncanny right diagnosis, but especially his healing success puzzled them. Some stayed on to learn, others went home all over Europe to start their own ‘Kneipp Spa’. An ever increasing stream of visitors with no accommodations aside from hay barns enticed entrepreneurs to start building hotels, guest houses and restaurants. Kneipp had written more books. He used the royalties and the donations freely given by the wealthy to build two sanatoria, the “Sebastianeum” and the “Kneippianum” and a wonderful “Children’s Hospital” where a mother or father could stay with their sick child until ‘cured’. 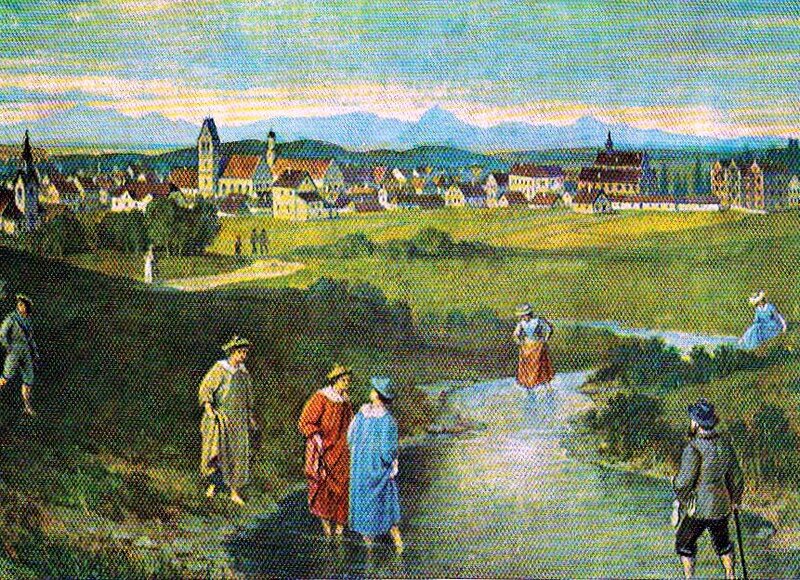 Kneipp, once upon a time a very poor boy, was now considered “rich” but in truth he did not own anything. He donated those buildings to different catholic brotherhoods (i.e. the Benedictines) to run and take care of other health seeking brothers. There is a rumor the “Sebastianeum” was empty on many nights – and since one entrepreneur had built a hotel for nuns close by that’s where the brothers could be found… Don’t take my word for it! The Children’s Hospital was given to a convent and run by nuns. I have stayed in the now, available for both sexes, “Sebastianeum” (168 beds) several times. I always felt close to Father Kneipp as all his advice and his teachings are followed there. I consider him to be one of my spiritual fathers. The “Kneippianum”, still run by nuns today, was developed into a highly specialized clinic for heart disease, employs the best doctors; it owns all the diagnostic machines and tools to diagnose and treat patients scientifically, always complemented by Kneipp therapy. 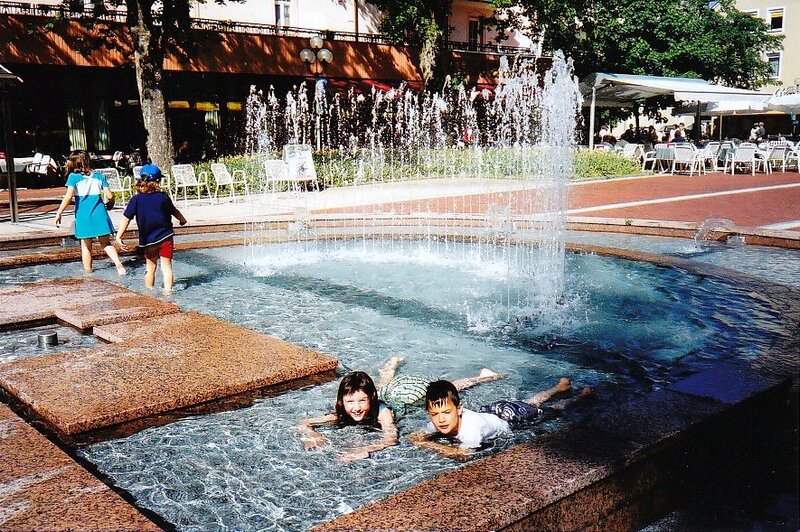 Bad Woerishofen has many fountains – kids love them! Part 3 will deal with his treatment system as it was developed and used to this day. Can you understand how I wished I could explain more to him? But no, a doctor is always in a hurry to see the next patient. There is no time. I was inspired by what he said and decided I’ll tell YOU about the history and how the “water treatments” came to influence the health system in Europe during the 19th century. Imagine a little boy, born to a poor weaver’s family in 1821. He had to work as soon as he could walk. His mother collected edible weeds and healing plants. He learned eagerly, and with great interest. At only four years old he had to earn his keep by herding a farmer’s cows out into the meadows. When a cow tripped and hurt her leg when drinking from a small stream little ‘Bastian’ was afraid he would get punished for the cow limping. He watched her stepping into the stream, standing there in the ice cold alpine water, lifting the hurt leg up and after a few seconds putting it back down. It went on for nearly an hour. When driving them home the cow walked normally. He never forgot that experience. At seven years old at dinner, consisting of just boiled potatoes, he reached for the little salt shaker, just as his dad was doing, to sprinkle it over the potatoes. His mom slapped him “You don’t earn your salt yet…” During the winters he had to help his dad in the basement with the weaving. As a young lad he started to spit blood. Already at a very young age he expressed his wish to become a priest. They seemed to be well fed and they could be in the beautiful basilica they attended Sundays, any time they wanted. “If God had wanted you to become a priest He would have given you rich parents.” He hardly had any schooling, knew only what the cobbler in the village tried to teach the young to at least be able to read and write. But our little guy was determined to enter the church. One problem was that he had to learn Latin. Nobody wanted to help him until he approached and convinced an uncle, himself a priest in another town. His uncle found a school for him and he taught him Latin in the evenings. As a teenager he got a rampant lung disease and was laid off for a long time. He thought of the cow in the stream and started to jump daily into the cold waters of the Danube. He did not own a towel so he would get dressed quickly and run home as his blood circulation was heating up his body. Incredibly, he recovered and finally, at 27 years of age and against all odds he was accepted at the priest seminary of the university in Munich. Working in the university gardens, having very little food and studying long hours he got TB again. He came across a little book in the university library, written a century earlier by two doctors Hahn (father and son) about the ‘Effect of Water into and unto the Human Body’. He had nothing to lose and started following their program. He could not jump into a river but he used the watering can behind the university garden shed to “water” himself. Again, he harnessed the disease and other students came to him, begging to be treated as well. I don’t have to tell you about the difficulties he got into because of it but despite everything – in 1852 he had reached his goal: He passed the rigorous health test and he was ordained as a priest. I will tell you more of the system Sebastian Kneipp developed. His legacy was left to the medical profession with the challenge to “Develop my system further and make it accessible to all.” It is known as “complementary medicine” and saves the insurance companies a bundle. 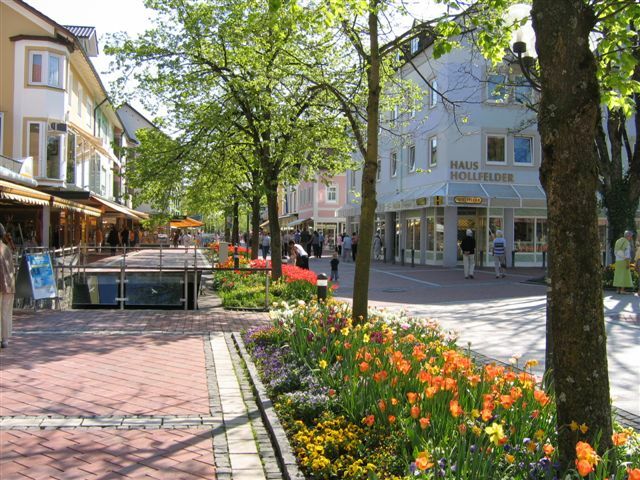 I was certified as a Kneipp-Therapist in Germany. I wrote my little book “Healing with Water” to help people on the American Continent who knew nothing about this simple method to stabilize their health. I have always loved water but not necessarily cold water when I was a kid, especially not when my mother splashed me with it while enjoying the beach and I was slowly entering our lake.. Nowadays I have a cold shower after a hot day. Or I use the gardenhose to let cold water run down my legs when they are hot and swollen. I let cold water run over my face every morning and concentrate on the area behind my ears. My doctor told me “if you do that daily you’ll not get Alzheimers.” (hope it’s not too late to start when you already have it). 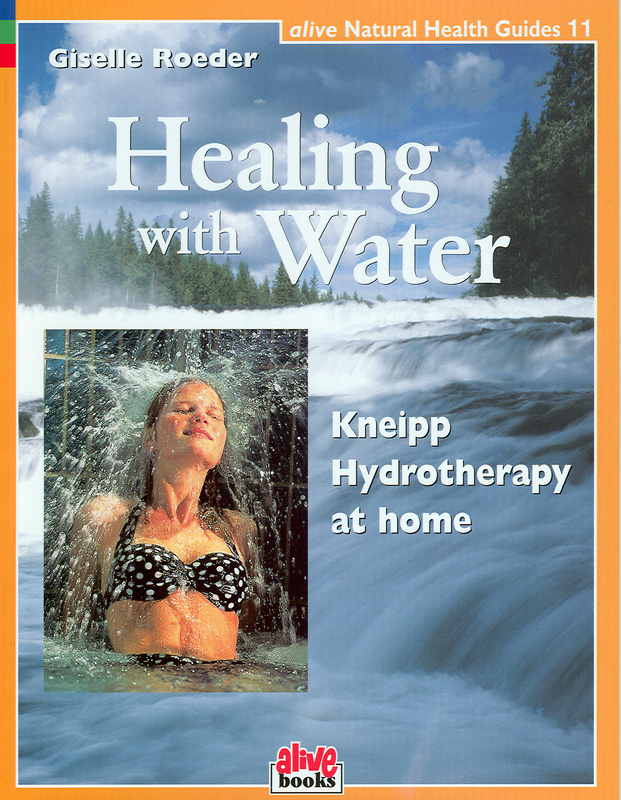 I studied “Kneipp-Hydro (water) therapy and couldn’t do without using it. Either just hot, or warm, or cold or alternate, depending on what body systems you address, what problem you wish to aliviate. You can’t fall asleep if you have cold feet. You can’t fall asleep when your feet are too hot. Read more in my “Healing with Water” book. But would cats love water? I experienced our curious cat slipping into the bathtub when checking out the foamy ‘bubbles’ surrounding my toddler playing with them. We laughed our heads off watching the cat get out and running away. Watch this delightful video, you’ll be amazed how some cats can love water, wash themselves, wash their head, can swim, relax or cool down. You’ll have a good three minute laugh, good for your soul. 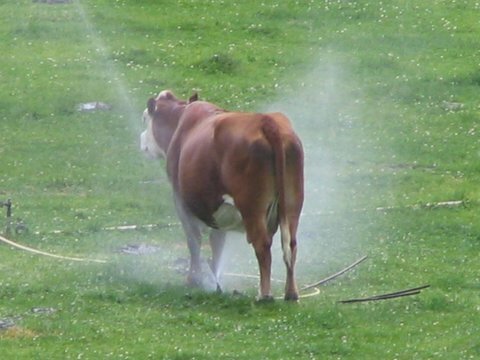 And cows know how to keep their “milk cool” on a hot summer day!